Family Free Day at the Zoo! While you’re here for Family Free Day, check out some of our new feathered friends in the Aviary! 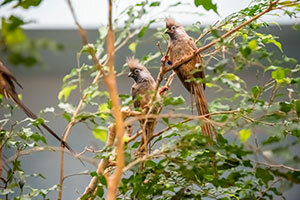 Our sunbittern youngster and Luzon bleeding heart doves have fledged, and we also have two speckled mousebird fledglings (pictured above) in the Termite Exhibit. There are many Inca tern fledglings in East Flight, which are really fun to watch as they learn how to fly. It is easy to tell them apart from the adults as they don’t yet have the red beak and feet or a moustache!